Looking back at all the pictures i've taken think i can write a book liao haha! Have so much to say about my first trip to Japan and i can assure this is definitely not my last, if it's possible i would like to visit this beautiful country annually. I could't agree more with あなた when he said that you can never get bored of Japan (his 3rd visit) because it has so much to offer! Every year, there are different things to see and experience, more memories to be made in this land of the rising sun. Prior to this trip i was really devastated about the Bali event which i was invited as a cosplay guest but apparently it was a hoax. Sigh..thinking about it right now makes my heart sink even further than it already could. But one day i'll try to gather up the courage to share about it k? For now if you want to know the inside investigation of it, you can read my friend's post here. Obviously was charged extra $700 (myr) for changing my flight ticket (twice) last minute before the flight next morning at 11am which was bound for Haneda (same initial flight with あなた). If not i would have to take the flight on the 1st oct by myself which i was clearly reluctant to as i don't know how the train system works in Japan lol. Seriously as a first timer, viewing Japan's train map is insane @@ It's good that everything is connected but at the same time super confusing (for me la), need some time to digest all of it. Not to mention i didn't even pack till a few hours before my morning flight, all because things got screwed up with my Bali trip plans. I got to know of the bad news while i was having my hair done at Daisuke salon and that night when i got home, i totally broke down. At that point of time i couldn't care less anymore, i told myself to F*ck everything and just go to Japan. No point wasting my precious time and thoughts over the Bali event. Next thing i know i was on the plane to Japan. Like FINALLY! Though i didn't get the window seat (everyone wants that lol), nor got to seat beside あなた throughout that 6 hour flight but i couldn't care less because i am going to Japan *weee~*. But it didn't stop there, as i grew i soon saw there was more to Japan than just their manga & cosplay, started to discover their fashion and lifestyle, things & opportunities this country has to offer. But all those was just a dream for a student, never did i expect to visit this place so soon and though i went unprepared, there wasn't any inch of regret at all (maybe abit la lol wished i studied the language better). The night before my flight i couldn't believe i still didn't have a place to stay lol that's like every traveler's worst nightmare when hell breaks loose on their initial travelling plans. Obviously i panicked la, which sane human wouldn't? You are finally going to visit a country you've been dying to visit and yet you have not made any accommodation plans upon your arrival. That was because i DIDN'T expect to arrive 2 days early (thanks to stupid DAF cancellation) in Japan and あなた thought of just bunking with his mates in a small apartment before i came into the picture. So now あなた was stuck with me because we don't think the apartment his friends rented had extra space for 2 people. So our plan B was to check out Airbnb to find any suitable locations that's nearby to train stations, that would accept last minute requests. I wouldn't kid you on how last minute this was, on 29th sept at 11.30pm i changed my flight ticket for 30th sept, 11am. And while あなた was helping me change the ticket, i was busy hunting high and low for places that would take us in on the 1st Oct.
At that point of time i might be desperate but i was super reluctant to give in, that's when i remembered blogging about this travel website called Traveloka and had a $50 (USD) voucher for it (thank you Grace Myu!) 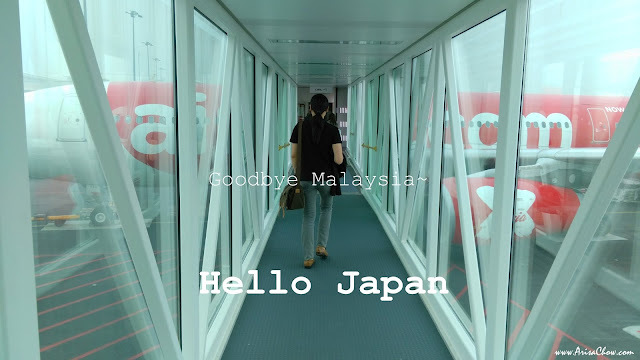 looking back at that entry there was a Dejavu moment because i did mention about my Japan trip there lol! 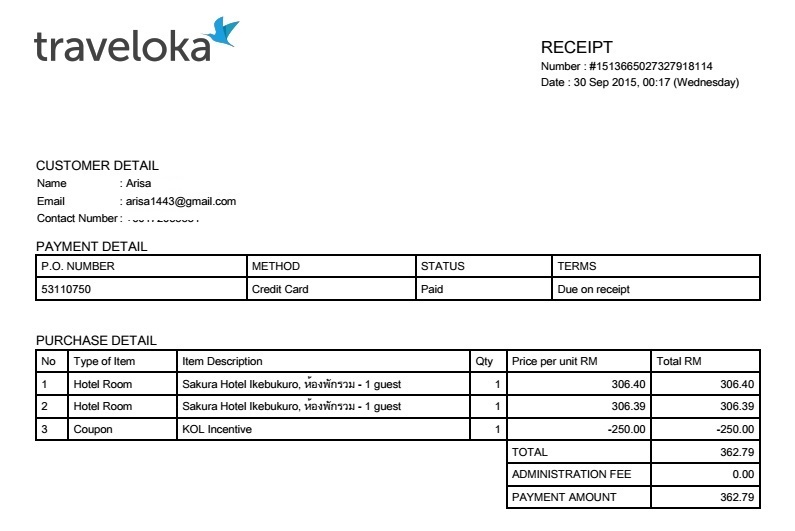 Managed to find 1 place that suited our budget & location (also happens to be the only place available on that date) which was Sakura Hotel in Ikebukuro. I'm really thankful they had a slot and took in last minute reservations though their booking method on Traveloka was kinda confusing. It gave us only separate options for rooms- Male & Female. According to their description on the page, Sakura hotel was some kind of dormitory despite being named "hotel" but we weren't too sure about how their dorm arrangement was like till we arrived on the 1st (Thursday). Based from my experience with travel dorms it's usually unisex unless it's school or the army where they separate both genders lol. Could proudly say this was my record breaking speed for packing traveling clothes lol, all done and zipped within an hour, next thing we know we were on our way to the airport to check-in *yawn*. Didn't get much sleep during the flight (as always) because i always get nervous and jittery during a turbulence. And lo, we arrived at Haneda airport around 10pm+ (9pm Malaysia time) despite having a take off delay of nearly 1 hour in Malaysia (typical). 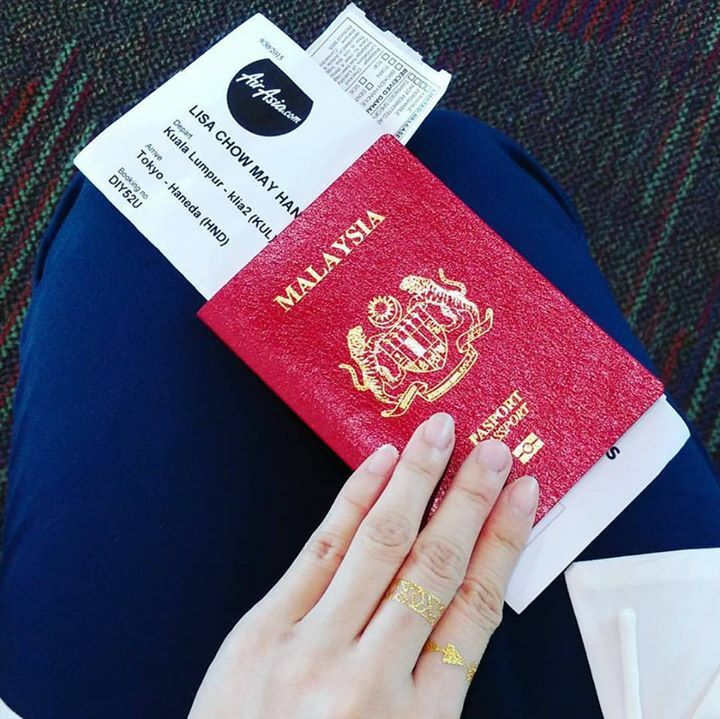 I was so glad to bid farewell to the haze when the plane took off lol, super jakun in fact that i don't have to breathe this terrible smog filled air. 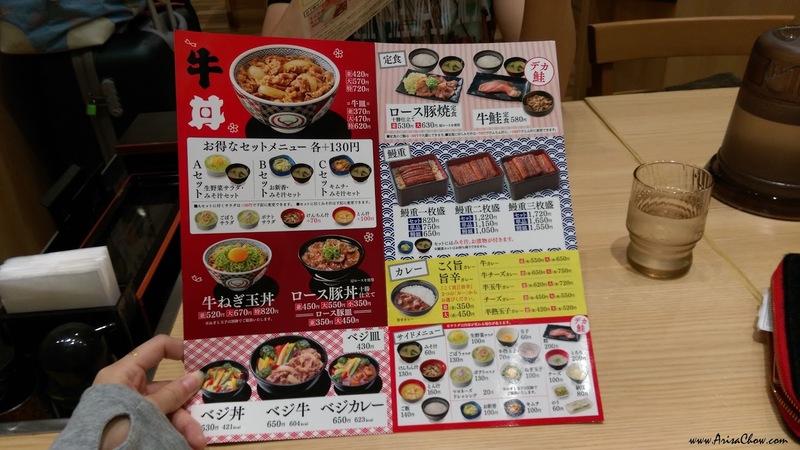 Pricing of eating out in Japan can be expensive if you don't watch what you order. 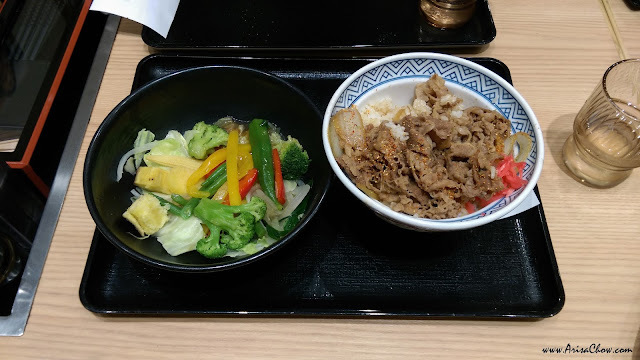 Too bad most shops in the airport has already closed except the 24hr Gyudon place called yoshinoya which we have it in KL too but not as great tasting as here (according to あなた) & MOS burger. Finally had my first taste of the beef rice bowl which is considered a "staple" diet among locals lolol. Well yoshinoya is considered like a fast food joint, so food here are all pre-made before being distributed to restaurant branches. It wasn't till much later we discovered there was a 24 hr konbini (convenient store) located on the lower ground floor of Haneda Airport lol, all this while we assumed the only makan place was Yoshinoya & MOS. So if you so happen to arrive late at night with no choice but to be stuck in the airport till morning and don't feel like having heavy meals just head downstairs towards the kobini (LAWSON). This is my first time seeing so many fresh food on the shelves, heck in Malaysia the only "fresh" food selection we have in our convenient stores are mee goreng, fried fishball/sausage and nasi lemak (and they all look so unappetizing). Over here you can find- spaghetti, sushi, salads, omurice, fresh cut fruits, and so much more! Plus they don't look so "dead" like ours lol. These are just leftovers at 3am, almost empty liao lol. Look what i found at the Konbini entrance lol! 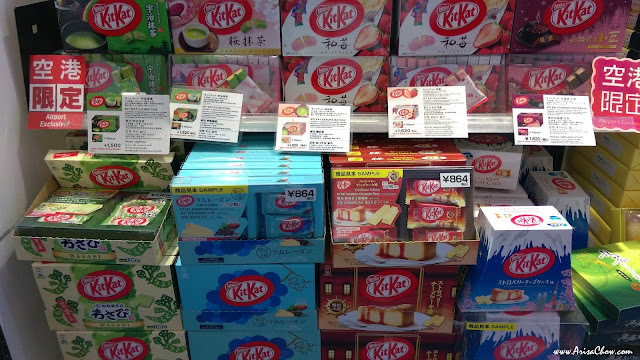 Kitkatsssssss! Lesson learnt, next time what you see in Tokyo just buy them there as you won't find the same stuff in other prefectures. Well, that's all for my first day or first few early hours in Japan lol, the rest was spent sleeping upright on the bench till my neck hurts and don't worry as this post doesn't just end here. I'll blog more about places to stay while in Tokyo based on my experience as a first timer and review them too to make decision making easier for you guys if you are planning to visit Japan soon! 2. Where to buy make ups (both normal and cosplay) - also kabuki/ Geisha make up materials. Everything happen for a reason. If you think positive, good things will come your way eventually. Glad that you had a great time in Japan. Looking forward to read more as I will also be going there next year. Enjoy your trip! I love Japan, especilaly their food! poor you kena overcharged. >< ..
i saw kit kat.. yummmmz..
Should visit their kitkat factory haha, apparently they have the most flavours over there. Yea, walking around endlessly here also is surprisingly fun lol. just the best memories to cover/erase the bad things happens in ur life! Airasia has quite some good deals occasionally. 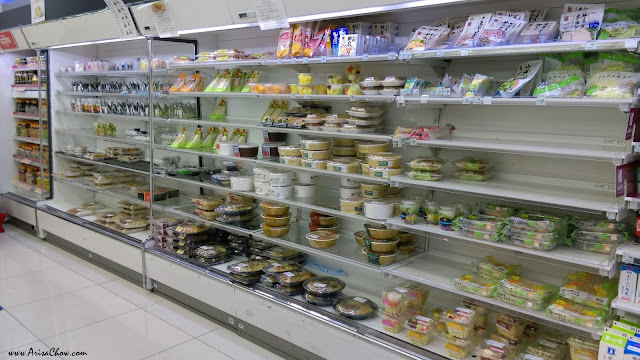 I love to hop into Japanese convenient stores they have so many types of pre-cooked meals and also ready to eat pack meals. I was thinking of self-cooking in japan.